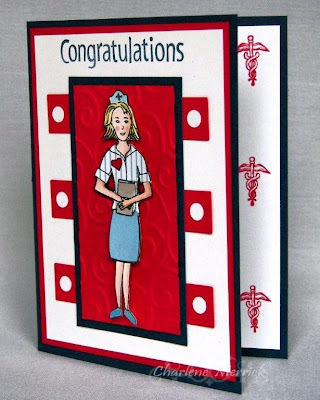 I was so tickled when my friend, Carolyn King, designed this Nurse Feelgood stamp set for Gina K Designs, as I knew I'd be able to put it to good use. Several years ago, I hired a senior high school student to assist with general clerical activities in the office. She was a wonderful asset to our office, but, of course, had dreams of going to college. She recently graduated from nursing school, and I am so proud of her! I paper pieced the uniform, heart, book, and her arms and colored the rest of her with Copic markers. I used the sketch design from Our Creative Corner and the color challenge from Stamp TV (there's a link on my sidebar) to use blue and red (also issued by Carolyn). You can see I stamped the medical symbol, which is from the same stamp set, on the righthand side of the inside of the card. Charlene she will love this. I think it is so great to see these kids grow into their own skin. I am sure you were a great mentor to her. Super job on this one. We need more great nurses..
Charlene you rocked this one!!! How fabulous!! Both for her, and your card with all the RED! (I must tell you that on my blog it says you hired a high school stud! WOW, did I laugh!!! Love the pieced uniform Charlene!! Fabulous card my friend! It will be treasured for sure!! AWWW - Charlene - your friend is gonna love this awesome card!!! Perfect image for the perfect occasion :)!!! Do the inside you big dummy! Anyway, what fun using Cammie's set. You did her proud, perfect in the red and white! Thats a big accomplishment and she will be honored to be congratulated by you with this card!